The holidays are a special time of year. People are cheerful, snow begins to fall, college football bowl season arrives and of course, Santa and Fumbles the Elf come. It’s a time of giving, but college football fans deserve something too. After all, they’ve been supporting their teams through thick and thin. After a season with so many ups and downs, their wish list might be filled with antacids and aspirin. But rest easy, the future is bright for your team. 5.) Extra Sticky Gloves – Between dropped passes, interceptions and fumbles, watching your favorite team’s offensive struggles can quickly turn any Tiny Tim into Ebenezer Scrooge. Sticky gloves wrapped in a bow would turn any college football fan’s frown upside down. 4.) Another Batch of Junior Returns – Nothing pains college football fans more than seeing their favorite players opt for the NFL draft after a strong season. One social media post from a player announcing his return is all it takes to have fans screaming for milk and cookies. 3.) A Basket of Recruits – With Early Signing Day in December and National Signing Day just a few months away (and taking place at the Hall), every college football fan would love a cornucopia of four-star and five-star recruits under their tree. If you can’t think of any clever ways to make this happen, helicopter visits always seem to help. 2.) New Threads – Look good, feel good, play good. Few things pump a team up more than different uniform combos. Armed with alternate jerseys during a bowl game, your favorite team will be dusting off their duds with every touchdown. 1.) A Playoff Berth or Bowl Game – What all good college football fans want more than anything this time of year is a playoff berth or solid bowl game. Consider a visit from the Ghosts of Playoff Teams Past, Present and Yet to Come for a final strong push to the 2017 season. The College Football Hall of Fame and Chick-fil-A Fan Experience is decking the Hall this holiday season now through New Year’s Day. Downtown Atlanta’s most interactive attraction will enshrine holiday happiness, kicking off the most wonderful time of the year with activities, treats and holiday decorations. The Hall will be “decked out” with holiday decorations with activities including watching holiday movie classics like Dr. Seuss’ How the Grinch Stole Christmas and special appearances by Fumbles the Elf. 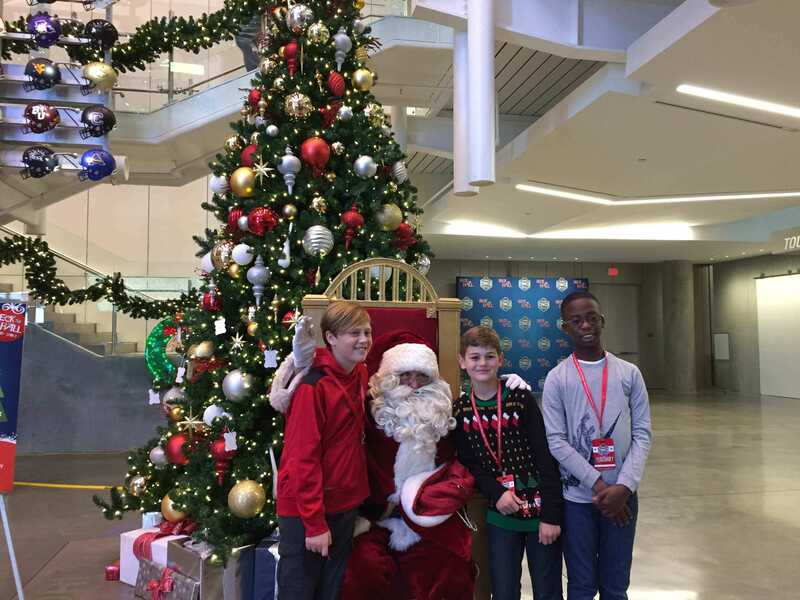 If you are still in need of the perfect family photo for the holidays, Santa will visit the Hall on Saturdays and Sundays from 10 am – 2 pm and there will have plenty of college themed props for your very own team photo.